Gordon Brown says immigration is good for the UK and has rejected suggestions that an annual limit is needed. The PM was responding to a report by a House of Lords committee saying record immigration had had "little or no" impact on people's economic well-being. Mr Brown said the concerns raised were being tackled by a new points-based system that will allow only highly skilled workers into the UK. He said migration had added £6bn to the economy and was a "substantial income". Most British businesses who have faced labour shortages had benefited from being able to recruit more widely for skilled labour, he said. Speaking at his monthly news conference, he said the Australian-style points-based system would effectively "restrict the numbers of people who come into this country from outside Europe". It would bar unskilled immigrants from outside the European Union, he said. There would be a new citizenship fund, with people coming into the country being expected to contribute to the public services they use. And there was more financial help for local authorities to enable them to deal with the influx. Mr Brown conceded that it was important to get the balance right given "pressures on the economy". But he said that gross domestic product per head had risen since 1997 from £13,900 to £22,840 in the last year. "Most people in the City of London know they have benefited very substantially," he told reporters. "Not just from the inward investment that's coming from international companies, but the number of key workers who are coming to join them and are making a huge contribution to the British economy. "But we want to get the balance right between that and of course being sensible about the pressures on our economy." Mr Brown said a cap on immigrants coming to the UK could only be applied to those outside the EU. "Most people who are proposing a cap are proposing a cap of only 20% of possible migrants into this country," he said. "And of course many of these people are the highly skilled workers who are important to the economy." Mr Brown's comments follow a report by the Lords Economic Affairs Committee which says competition from immigrants had had a negative impact on the low paid, on training for young UK workers, and had contributed to high house prices. The peers called for a cap on immigration levels, saying the government "should have an explicit target range" and set rules to keep within that limit. They raised the prospect of cutting the rights of people to follow relatives who have settled in the UK. And they rejected claims by ministers that a high level of immigration was needed to prevent labour shortages as "fundamentally flawed". They also warned that the points-based system carried a "clear danger of inconsistencies and overlap". The committee, whose members include two ex-chancellors and other Cabinet members, took eight months to consider government immigration policies. Inquiry chairman Lord Wakeham said: "Looking to the future, if you have got that increase in numbers and you haven't got any economic benefit from it, you have got to ask yourself, is that a wise thing to do? "That is why we want the government to look at it." Committee chairman Lord Vallance of Tummel, a former CBI president, said the government's analysis of the economic impact from immigration was "very shaky". The report claims that if net immigration of 190,000 people per year continued over the next 20 years, it would contribute to a 10% increase in house prices. Shadow home secretary David Davis said the peers had shown "unequivocally that the benefits of the current immigration policy to ordinary UK citizens are largely non-existent". Chris Huhne, the Lib Dems home affairs spokesman, said the report made clear that "the government has completely lost track of the number of people who live in this country". UK Independence Party leader Nigel Farage said: "The fact still remains that all three parties voted for an enlarged EU and open borders with half a billion people living in the EU." 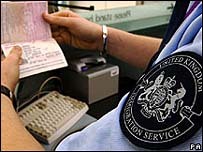 Sir Andrew Green of pressure group Migration Watch, said the report had "torn to shreds the government's economic case for the massive levels of immigration which they have actively encouraged".